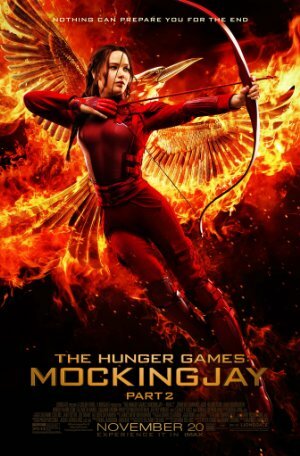 The Hunger Games: Mockingjay – Part 1 ends with Peeta (Hutcherson) trying to choke the life out of Katniss (Lawrence) who has become the Mockingjay, symbol of the rebellion against President Snow (Sutherland) and the capitol of Panem. Part 2 begins with Katniss recovering from that assault and the rebels attempting to undo what had been done to Peeta. He’d been tortured and brainwashed using the venom of tracker-jackers. Alma Coin (Moore) is the leader of the rebellion and she has plans to take the capital. It involves destroying the capital’s weapons supply stored in District 2, followed by a direct assault on the capital. The game-makers who work for President Snow have made the second phase of this plan extremely difficult, hiding multiple pods all through the outer edges of the capital. These pods contain highly lethal, extremely diabolical booby traps. Katniss’ role in President Coin’s plan is to be the face of the rebellion through shooting propaganda films while she is safely ensconced in District 13. But she sneaks out to get to join the rebel forces just outside the capital. She plans to somehow get through to where President Snow is and kill him herself. Once she reaches the rebel staging area, she finds herself attached to a squad with Gale (Hemsworth) and Finnick (Clafin). Led by Boggs (Ali) with Lieutenant Jackson (Phillips) as the second in command, the squad’s job is to shoot those propaganda films but within the capital. They are heavily armed and have a holo that has the most up to date map of the pods the rebels have. The question is, can they make it safely through the capital to the center of the city where President Snow’s palace lies. But much lies ahead for Katniss and her squad members as they try to move through the city. For those who have read the book, they know the story and what happens in the city. The main plot points of the novel are present in the film. The action is intense and some of the violence may disquiet members of an audience who are a little more squeamish than others. Even if you haven’t read the book, you know that not all of the members of Katniss’ squad will survive the mission. The question is who will, and why. And what will happen at the climactic moment. A dystopian future, a struggle between the haves and the have-nots and much more of what is here is typical of many films of the last ten years or so. What made these films different was the struggle of the annual Hunger Games, and here that is barely present in the battle of Katniss and her squad to battle through the defenses of the capital. The difference is that they are fighting machines and game-maker constructs, rather than other tributes. It isn’t as satisfying. Jennifer Lawrence is one of the most talented actresses of her generation and she’s been recognized for it. Here she’s stuck with a role that’s already been defined by three prior films and is therefore somewhat limited. But she still makes the most of it. The acting by all is good, the visuals and special effects are extremely pleasing to watch and the running time of two hours and 17 minutes seems to fly by. Plot: As the war of Panem escalates to the destruction of other districts by the Capitol, Katniss Everdeen, the reluctant leader of the rebellion, must bring together an army against President Snow, while all she holds dear hangs in the balance.